Suave is an aspiring UK based RNB and Hip Hop urban MC. With origins from South London he has a smooth street style and lyrics laced with sophistication and finesse. 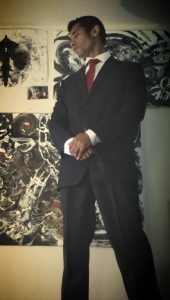 Within his music he portrays real messages surrounded by an old-school Hip Hop ambience. Genres: Garage, House, Drum and bass. 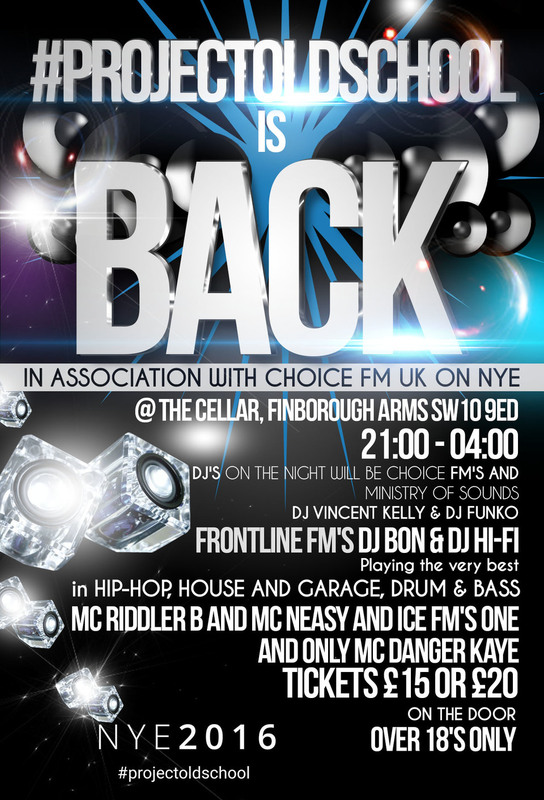 #PROJECTOLDSCHOOL IN ASSOCIATION WITH CHOICE FM UK ON NYE @ THE CELLAR, FINBOROUGH ARMS SW10 9ED FANCY DRESS COSTUMES WELCOME. PLAYING THE VERY BEST IN OLD SCHOOL HIPHOP, HOUSE AND GARAGE AND DRUM AND BASS. With the release of her brand new Music video and new single ‘Back To Live’, the wonderfully talented Roxxxan was kind enough to have a quick chat with us about herself. Hi Roxxxan – how are you? I’m a GANJAH puffin, CRYSTAL rubbing, UNIVERSE trusting, SWAGGA muffin, DAGGA loving, OWE you nothing, CALL your bluffing,type of g (girl) lol! What inspired you to become an MC? Ms Dynamite, seeing her spit alongside the men (So Solid Crew) it felt like me at the time, growing up around all the boys that respected me. Your new single ‘Back to Live’ is a darker entry than your previous work. What inspired you to create this? (Living it) Sitting in my hostel feeling alone and miles from planet earth. I put my headphones in and wrote it all as if I have already written it. Can we expect much of the same in your future songs? You can expect the same honesty, but no haha! I’m good I’m settled and over come my dark patch. Back To Live was me letting it all out to move on and encourage people in similar situations. And a reminder to myself that i got through it! Working with Mikey J. I know that sounds so cheesy but I’m so grateful for him not only is he an amazing producer he’s a good person one of my best friends and has always had my back and gave me the real as raw as it might be. I appreciate that. Being signed was great having an advance living rich for a year ( haha) was great but I want more then gas. How was the backpack gang created? Is it something you still focus on? We’ve heard you used to do boxing? Is that something you still do? What is next for Roxxxan? Finally – what piece of advice would you give any aspiring MC and artists out there? Find yourself. Be patience and most of all WORK HARD! Boss of the backpack gang, Roxxxan makes a deliberate and perfectly timed return in to the ring with the release of ‘Back To Live’. The Birmingham ambassador has previously sparred alongside respected MCs like P Money, on sets with Goldie, Skream, Benga and Caspa whilst working with producers such as Yogi, TMS, Bless Beats, Wiley, Sunny, Donaeo, Mikey J and Riton on her releases that have seen her championed by the likes of former Radio 1 Dj Zane Lowe, DJ Target (1Xtra), Swerve (Kiss) and MistaJam (Radio1/1Xtra). Presenting an explorative delivery, ‘Back To Live’ feels darker, eloquent and matured, paying tribute to the wisdom and experience she has gathered on her journey. ‘Back To Live’ is a myriad of juxtaposition from the audio to the visuals. Frustration versus determination as emotion leads the bars and there’s a cold, hard, unapologetic urban landscape that sets the backdrop for the visual, which marries warmth and beauty in to it via flashes of colour and style. A clear risk taker, Roxxxan has always presented her craft in a way that can only be taken seriously. 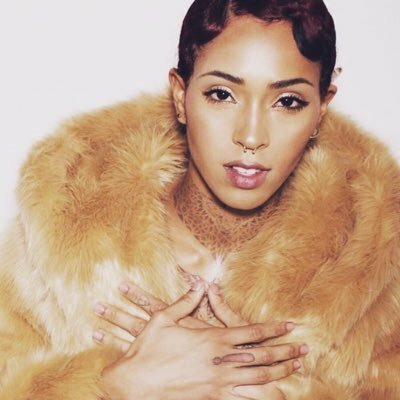 Honest, spicey and explosive lyrics, as demonstrated on Charlie Sloth’s Fire In Booth, make you gravitate towards the interesting and talented individual that she is. As the initial taste to her forthcoming E.P set for release, Roxxxan is back and is ‘Back to Live’. 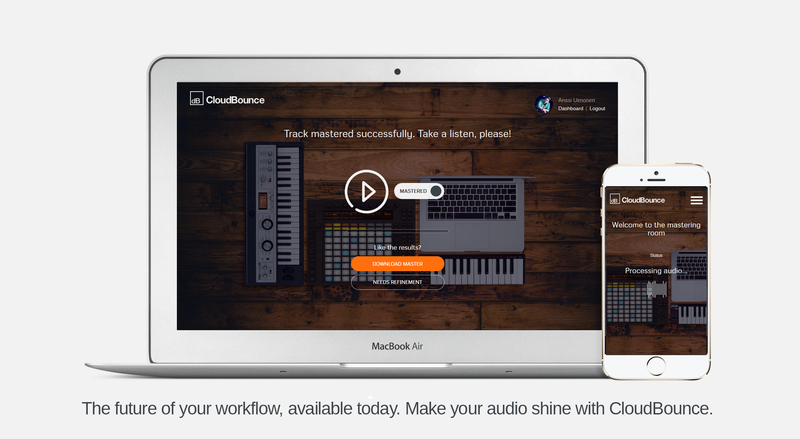 Get 1 hi-res master (24bit wav & 320kbps mp3) and 30% discount from a subscription by signing up to CloudBounce. 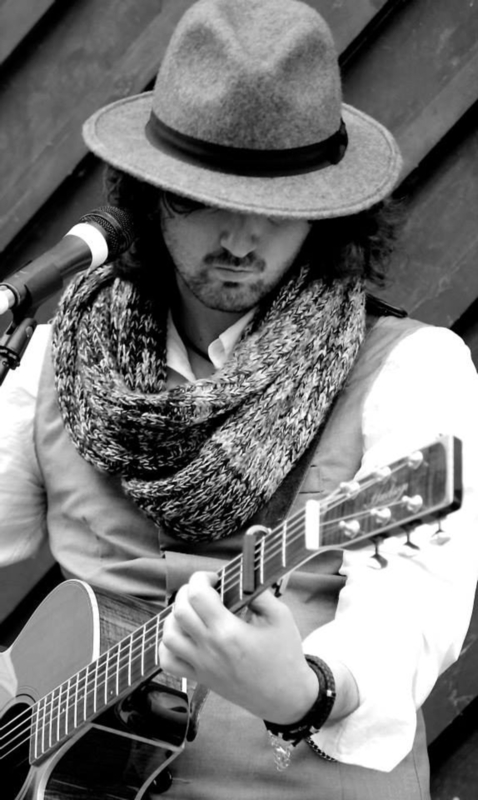 With the release of his new Music video and new single ‘My Love (Bring out the Guards) due for release on Friday 4th March, the wonderfully talented Ragsy was kind enough to have a quick chat with us about himself. Hi Ragsy – how are you? I’m currently at Northhouse Studios working on the next single and demoing new material for the next EP. What was it like to be a contestant on The Voice? Would you recommend it to musicians / artists? I would recommend applying to the show if the musician / artist were looking to gain more exposure, a platform to be able to promote themselves further and build on this as part of their musical apprenticeship. I think that as long as you keep these factors in mind it’s a good opportunity and not a shortcut to the top. Your new single My Love is a beautiful song. Is it based on true life? The song is based on true life and is written about a relationship that has come to an end. A Situation I’m sure we’ve all experience at some point in our lives. In that moment of time you feel like you are losing everything and all you want to do is tell that person how you feel. Pouring out your soul and baring all. In the hope that you might just save everything. Rekindling and relight the spark to they’re heart. How did you hook up with Caroline Harrison? I met Caroline Harrison through performing at few shows. I was lucky to be on the same line up. Caroline has a beautiful voice. I was amazed the first time I got to see her perform. We got talking backstage a few times. We soon realised we had similar interests in music and similar experiences in the music industry. The collaboration idea organically grew from there. I knew I wanted to release ‘My Love’ as a single and could hear Caroline’s voice working well on this song. Caroline has brought something special to this song, beyond what I originally expected. Can we expect much of the same from you album ‘Ouch!!!’? Most of the songs from the album were wrote around 2012/2013 when I was going through a difficult time. I find Song writing very cathartic, it’s my go to for everything, no matter what I’m feeling or the circumstances. I try to write about everything I experience. Which has saved me a lot of money on shrink bills so far. So the album is much the same as in the themes of the songs as r written about true life. What is next for Ragsy? At the moment I’m focused on promoting the new single ‘My Love (Bring out the Guards) featuring Caroline Harrison which is out on Friday 4th March, with hopefully a follow up single soon after. I am currently working on a new EP which I hope to have ready for the summer and am organizing an intimate acoustic tour along everywhere and anywhere as well as hitting as many festivals as possible. So if you would like me to perform in your town or are a venue / festival interested in being a part of the tour please get in touch. I have a guitar and am willing to travel. 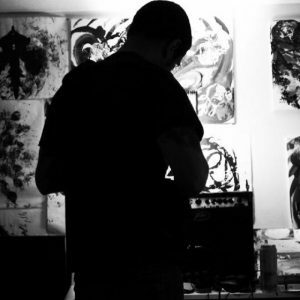 Finally – what piece of advice would you give any aspiring artists out there? I don’t know if I’m the right person to be giving anyone advice as I am still an aspiring artist trying to make my way in the music industry. Constantly learning and finding my way on my musical apprenticeship. I suppose for me it’s about believing in yourself, in your music, putting in the hard work, taking the opportunities that come your way, making the most of them and just being the best you can be. The rest is up to fate and in the lap of the gods. along with Ragsy’s impassioned performance of Coldplay’s ‘The Scientist’ on BBC’s The Voice has received over 2 million views on YouTube. 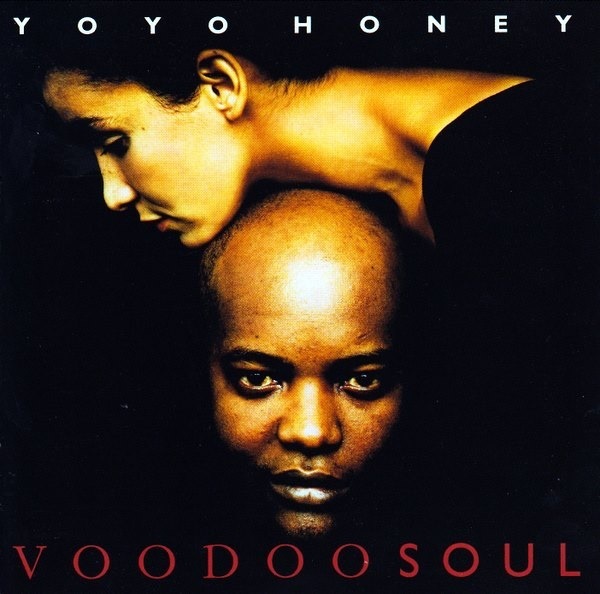 Electronic soul/dance group – Yo Yo Honey were formed in 1991 by Musician Mani Shoniwa and featured vocalist Anita Jarret. Their debut album ‘ Voodoo Soul’ was released in 1992 on the then Jive Records. The album featured a forty piece orchestra and included contributions from the then members of Soul II Soul. Its singles featured remixes by luminaries including Paul Oakenfold, DJ Pierre and Tony Humphries. To mark the twentieth anniversary of its release ‘Voodoo Soul’ has been re-mastered and includes new and unreleased mixes including a superb DJ Pierre Wildpitch take on ‘Groove On’. Hey Mani – how are you? I’m not enjoying this cold weather, otherwise I’m very good. When did you start writing/producing music – and what or who were your early influences? 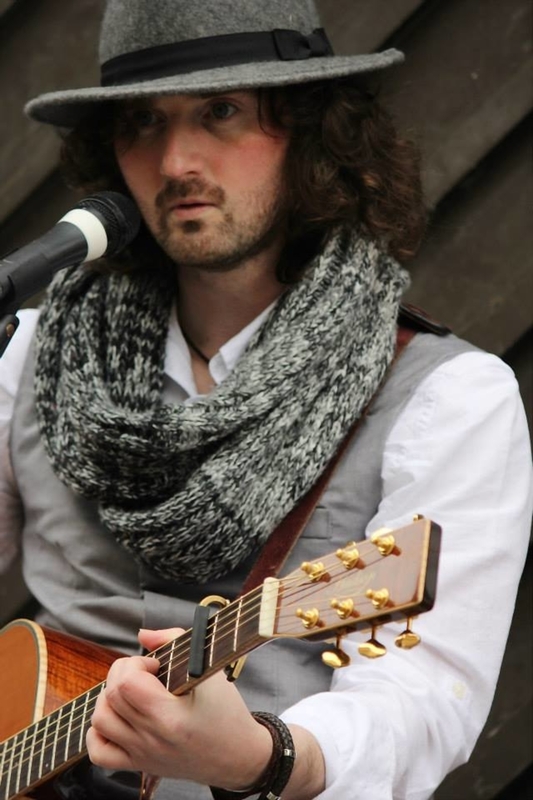 I’ve been playing live and writing music since I was fifteen. I released a couple of albums with London and Virgin Records which is when I really got interested in production. I was born into Tamla and Soul, Marvin Gaye in particular, Sly Stone, Hendrix, Parliament. Stevie wonder, and Bowie, Dub and Electronica were massive for me and then House hit me. Musically I’m quite technical and I’ve never had a problem with composition and song-writing. I’ve got a huge catalogue of musicality which came about through hard studying and listening. I still relish the challenge of constructing a great tune. The biggest challenge is often trying to de-construct and unlearn so that I can progress a tune. I’m into collaboration and experimentation that’s a big part of me. It doesn’t matter who I’m working with, whether its the very best musician or teaching some kid, new to music. I’m driven to explore and get the best out of what I’m working upon. I also enjoy working on my own, this is a challenge as it can leave you exposed and vulnerable . From a production point I’m also into experimentation. From an early age I learnt and understood tape. Beginning with a Grundig Stenorette, basically a giant Dictaphone, progressing to portastudios,(which I recorded B-Sides on). I eventually built my own digital/analogue studios with 2” tape. Pro-Tools and a 48 channel DDA desk . Up until recently I had all the toys but I got rid of them all as I was travelling a lot. I now write and mix on a Mac-book with Ableton Live 9. Which is great. What are currently some of the most favourite & important instruments you have used? Playing guitar and bass live for years taught me just how important feel is for music. In the creative process on the basis of a single or even an album where do your ideas come from, what do you start with and how do you go about shaping these ideas? I have to have something to say. I have a very voyeuristic view on things whether it’s a social observation, an obsession or some kind of sexual intoxication. I need intelligence in my music. If I didn’t, all I would write about would be rims and, ‘hey baby be my baby tonight’. Once I have that something to say then I can apply music and textures. And that is done via a myriad of twists and turns which all boil down to feel. I recently completed an album project ‘Black & Bruised’ which I wrote, produced and mixed in three days. Very experimental, without rules and challenging Other times it may take years to progress tune. If I feel it’s worth pursuing, I’ll persist, keep going back and nurturing. I’ve written so many tunes which I’ve stored and often wonder if should get on and get them out. 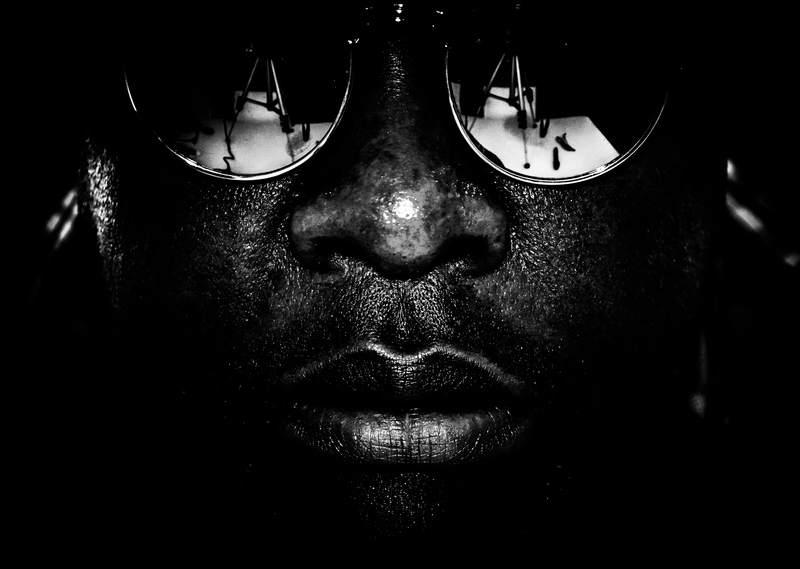 DJ Pierre remixed your ‘Groove On’ track to great effect. How important do you feel a remixer is to a release? If a remixer can bring something to the table I think its stellar if the contribution works. In the music industry there are a lot of buskers with conflicting agendas which do not necessarily for the benefit of the music. Pierre is intelligent and musical. He got the essence of the track and took it to a primal place which was maverick and I respect that. What plans do you have early 2016 and beyond? Essentially getting back closer to my art and doing what I do best which is writing tunes. I’ve stopped managing and other peripherals and regained my focus. I’ve got some healthy music which I’m excited about and which will be released. And maybe a collaboration or two with some cool people. 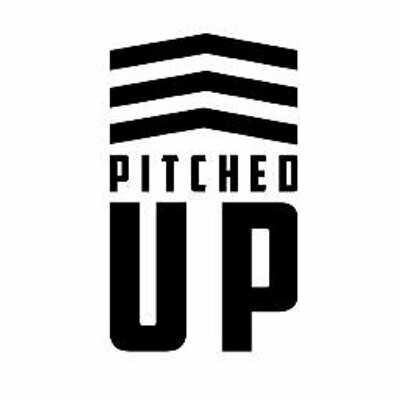 Pitched Up has become a seminal brand within the East London live music circuit, hitting it’s 1 year anniversary in December and going into it’s second year this year it’s growing bigger and better now the word has spread to most about the hottest mid-week event. 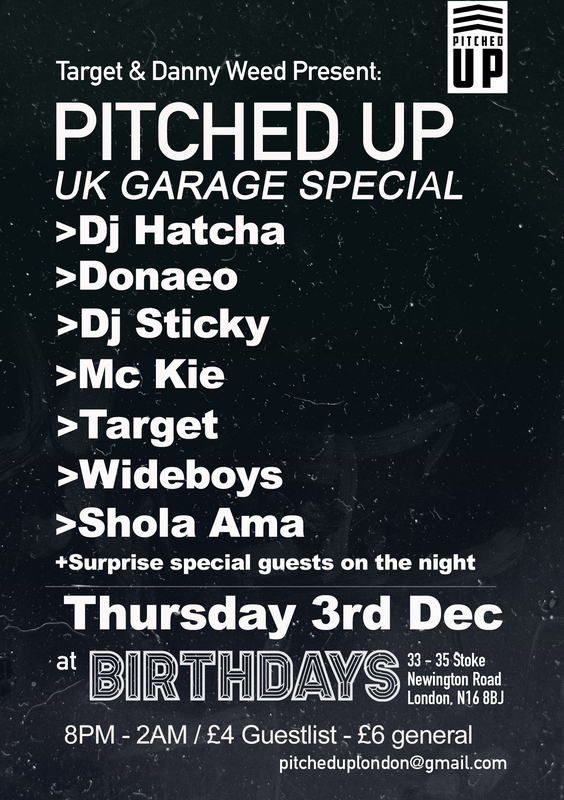 With a legacy of chart hits, successful independent careers as DJ’s and producers, long-term careers with one of the foundational Grime crews, respected tastemakers within the UK music industry and a successful monthlyentertainment and new music night that has just celebrated its first birthday, it is of great excitement and a credit to the music scene that DJ Target and Danny Weed have further developed their ‘Pitched Up’ brand to now encompass a Sony imprint record label. Having been pivotal to the careers of numerous UK acts, the duo’s focus on homegrown talent via their brand has become something of great aspiration. Priding itself on being a destination to see and hear the brand new acts that everyone’s talking about, the Pitched Up monthly night, held at Birthdays In Dalston, has become a place for music lovers and makers to experience music in an original, enjoyable and credible way, surrounded by like minded people. It seems set that the label will adopt a very similar ethos by giving acts an extended platform from which to launch their careers.